Ok, this is definitely a Sunday morning breakfast… if you manage to get out of bed early enough. Well not that it’s a long baking process but if you are ready to spend a couple of hours in the kitchen on a weekend then it is well worth it… just make sure you are alone or you move stealthy or “the sharks” will eat those little things at the first sniff. In a small cup add ¼ cup of warm milk along with a teaspoon of sugar and the yeast. Stir well and let it sit for 10-15 minutes. In the bowl of your mixer throw in the melted butter, add the eggs as well and mix. When yeast is frothy, pour it over the butter mixture along with the remaining milk and add some salt. When all is well incorporated gradually add the flour and keep mixing. If dough kinda sticks to your hands add some more flour until it doesn’t. :P When you are done, rub it with some oil, place in a warm place and let rest for an hour or two until it doubles in size. When those couple of hours have passed, cut the dough into 6 equal pieces and roll each one into a ball. Working with one ball at a time, roll out each one into a 12 to 14 inch (30-35 cm) circle. Using a pizza cutter, cut the dough into 8 equal triangles. 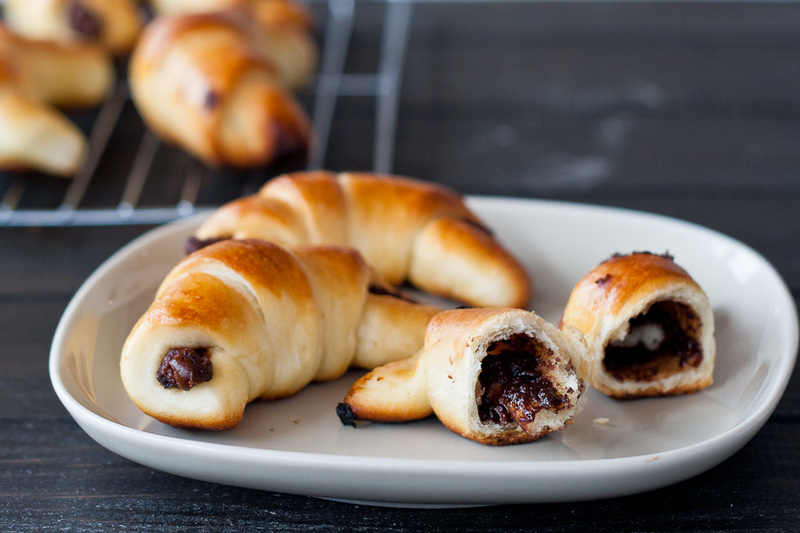 Drop a teaspoon of nutella (or any other crazy things you might think of) at the top of each triangle and roll each one like a croissant. Place the rolls on an ungreased baking sheet, about an inch (2.5 cm) apart, as many as you can. Brush egg wash over each roll and let them rest again for another 30 minutes while you preheat your oven to 375° F / 190° C.
Bake them for about 20 minutes or until nice and golden brown. If the rest of your family is still sleeping, stuff yourself as fast as you can, you might not get a second chance. Melt the butter (in microwave the fast way) and pour it into the bowl of your mixer along with those two eggs and sugar and mix well. Add the yeast mixture, milk and salt and continue until everything is well incorporated. Gradually add the flour and keep mixing. If dough kinda sticks to your hands add some more flour until it doesn’t. When you are done, rub it with some oil, place in a warm place and let rest for an hour or two until it doubles in size. When those couple of hours have passed, cut the dough into 6 equal pieces and roll each one into a ball. Working with one ball at a time, roll out each one into a 12 to 14 inch (30-35 cm) circle. Using a pizza cutter, cut the dough into 8 equal triangles. 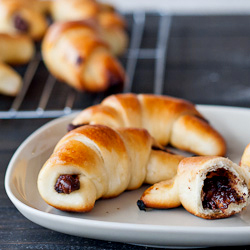 Drop a teaspoon of nutella (or any other crazy things you might think of) at the top of each triangle and roll each one like a croissant. Bake them for about 20 minutes or until nice and golden brown. Oh how could I ever let this recipe pass by without trying?! I have to try this. I just love the flavor of Nutella on anything. This is fantastic! they taste just great. do you think it’s possible to freeze them ? Yes, you can freeze them, I always do, best when heated in the toaster, not in the microwave. You can heat in the microwave, but be carefully,seconds only, or hey will loose the crispness and become too soft. This looks amazing! And easy to make as well. But I have one question. What flour did you use? Bread flour? wow, breakfast heaven here i come! these look perfect! Oh dear, I’m drooling. These look heavenly!! These look amazing! I’m a huge nutella fan and can’t wait to try these! Hi from Italy!! Do you think that once the rolls are ready on the rack it’s possible to store them in the fridge overnight and bake them in the morning?? I have no idea, sorry. I am not usually that patient. I realised there’s a half cup of sugar mentioned in the ingredients but not in the directions.